(Bloomberg) -- If Theresa May has a genius, it is for survival. A day that the British prime minister started battling a political crisis over Brexit that could have destroyed her, ended with May flying to a G-7 summit relatively unscathed. But while she escaped the immediate danger, a fresh storm blew up over secretly taped comments from her colorful Foreign Secretary, Boris Johnson. Speaking at a private dinner, he attacked her strategy, predicted a Brexit “meltdown” and said Donald Trump would do a better job of delivering the divorce. Johnson’s outburst -- leaked to Buzzfeed -- shows how for the prime minister leading a fragile government and encircled by critics, victory is only ever temporary. May’s spokeswoman, Alison Donnelly, insisted the prime minister still had confidence in Johnson, though the two haven’t yet discussed his remarks. “The prime minister believes that her Cabinet and her government are working hard to deliver the will of the people, and working hard to take back control of our money, our laws and our borders,” Donnelly told reporters in London on Friday. 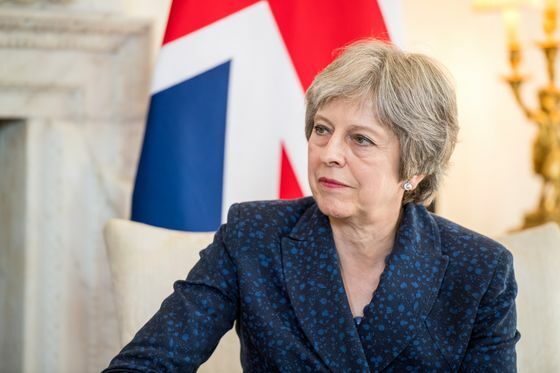 It is a year since May’s gamble on an early election backfired disastrously, costing her Conservatives their majority in Parliament and putting her own future -- and that of Brexit -- in doubt. Many on her own side thought she’d be gone within weeks of the June 2017 vote. But she’s come through a succession of crises and remains in office, despite threats and plots to oust her. In comments made to a dinner of around 20 people on Wednesday, Johnson said Britain’s approach to Brexit should be more like the one Trump would take. Then he turned to the divisions that are rocking the Cabinet, describing the arguments as “very, very difficult” and attacking Chancellor of the Exchequer Philip Hammond’s Treasury as “basically the heart of Remain,” the 2016 campaign to stay in the EU. Johnson’s comments emerged just hours after May had settled a critical dispute with her euroskeptic Brexit Secretary, David Davis, once seen as a leading candidate to replace her. He was said to be ready to quit, furious that May was proposing an open-ended commitment to stay in European customs rules in order to avoid a hard border with Ireland. 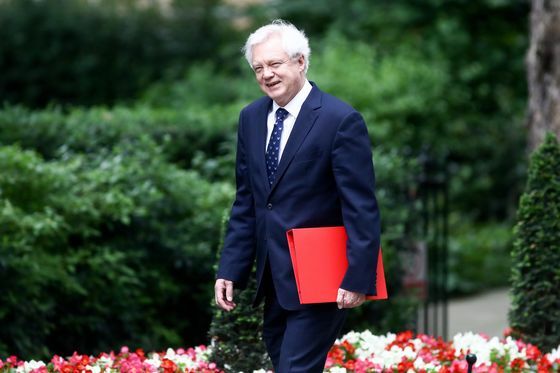 After two tense meetings, Davis’s allies trumpeted a victory, claiming he had persuaded her to insert an end date to the plan so the U.K. would not be bound forever by European trade law. But when the proposal was published, it was clear that the truth was more complex. Government officials privately admitted it was a “fudge.” There was no firm end date, only an aspiration that it “should be” time limited, and that the government “expects” it to last no longer than until December 2021. This was enough for Davis to claim a face-saving victory, but it didn’t impress other Brexit supporters in May’s party. While May and her allies tried to convince Tories to back her temporary customs arrangement, European officials were privately unimpressed. Michel Barnier, the EU’s chief Brexit negotiator, was more polite -- but hardly encouraging. He is due to give a press conference Friday before face-to-face talks with Davis on Monday.